Every day is Seniors' Day on PATCO! You already know that PATCO makes traveling between Center City Philadelphia and Southern New Jersey easier and more convenient than ever! But we also make it more affordable. With PATCO's Reduced Fare Program, seniors (age 65+), those with Medicare cards, and anyone with a disability can travel for significantly less! Click here to learn more. 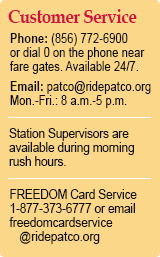 The new FREEDOM fare collection system includes wide, ADA-compliant fare gates at all PATCO stations. Elevators are located at Lindenwold, Woodcrest, Ferry Avenue, Broadway, 8th/Market, 9th/Locust and 15th/Locust Street Stations. All other stations (except City Hall and 9th/Locust Street) have an escalator that operates in the "up" direction.